Our IP address range for this lab is 192.168.1.0/24 and we want to reserve ip range 192.168.1.1 – 192.168.1.49 but allow the rest be available for our pool. My fake PC clients are all set to DHCP. 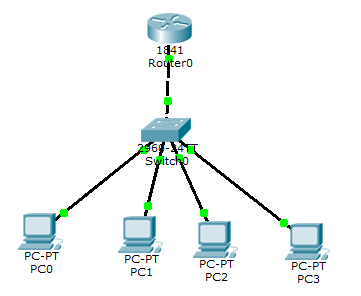 Step one: Assign an interface on the router for the network. Step two: Reserve your IP’s that you wish to exclude from your pool. Step three: Create your pool, in our test we are naming our pool “inside” but you may name yours whatever you want. Here is a link to Cisco’s Guide on DHCP, with cooler options than mine..
I’m a huge huge.. mystie.. I have been since maybe season 2? I was young.. I don’t remember when I started watching.. but Comedy Central and SciFi were both young at the time.. anyhow.. I’m super excited to see that this might happen.. and I really really want another MST3k season. So much that I’m willing to support it. Anyhow… I’ve gotten my family sucked into it.. they have a favorite.. it’s the Final Sacrifice.. the worst thing to ever come out of canada.. So by default on many IOS devices you can access via console cable or telnet, but telnet is not secure, luckily many cisco devices will support ssh, provided you set it up. Note- some older devices don’t allow ssh. In my lab I didn’t have settings in any Catalyst 35xx devices or example. I’ll break it down into the steps, if you have any of these already configured you can skip where you like. Step 1 – Set a Hostname and domain. The RSA key you will generate later needs a hostname and a domain since it’s a requirement. The RSA key is the same as the SSL keys you exchange when you use a web page via https. you will be prompted for the bit strength of the key and the default is 512. I use 1024, you can use more, keep in mind everything increases the larger you go. If you already have a key you will be warned to overwrite it. If you ever change the hostname or domain you will need to generate a new key. Step 3 – Create a user with higher privilege. bob is the username, the password is stored encrypted as Y0urM0m. This tells VTY to use the username you setup, and allows only ssh to be used over vty. It’s helpful to not close the Telnet session you have open while you test the ssh settings.. lest you forgot the password or well.. anything.. that would have you running to the device with a console cable.